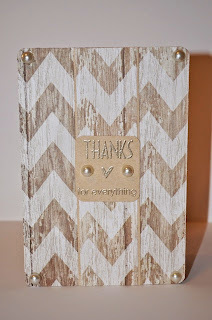 Papercrafting by G: Chevron & Wood Grain: A Surprisingly Beautiful Combination! 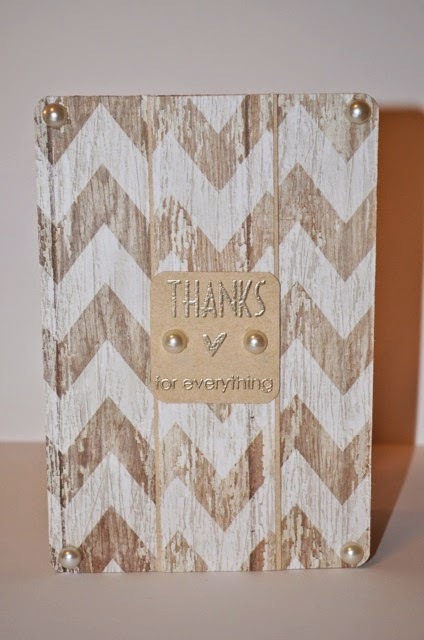 Chevron & Wood Grain: A Surprisingly Beautiful Combination! Hello, everyone! I recently found this cute 8.5" by 11" patterned scrapbooking paper by The Paper Studio at Hobby Lobby. I am a big fan of wood grain papers, and I have previously used some from a Teresa Collins paper pad. I picked up this paper from Hobby Lobby on a whim a few months ago, and this past weekend I finally put it to use. I made a thank you card and a happy birthday card with a single sheet of it, and I am planning on picking some more up because I love it that much. 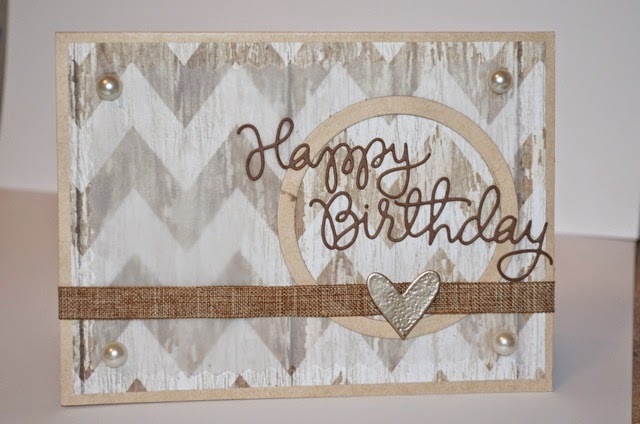 I love cards with a more rustic feel and kraft cardstock is my favorite color cardstock to use. I began with the happy birthday card, and I resorted to using one of my favorite card templates. I began by using a heavyweight natural kraft cardstock by Cardstock Warehouse that I found on Amazon for my card base. Kraft cardstocks vary in value (lightness/darkness) across brands, but I really have enjoyed the color of this particular cardstock. I cut down an A6 size card base and then cut my patterned paper so that the card base framed it by about 1/8 of an inch. From there, I took a piece of translucent vellum and cut it so that it measured 5.25" by 3.25". I used pair of zig zag decorative edge scissors to give it an edge that mimicked the sharpness of the chevron design found in the paper. I used my Sizzix circle die set to cut a circle in the right side of the vellum and to cut a circular frame for the circle out of kraft paper. Once all of this was adhered to the card, I used my Simon Says Stamp Happy Birthday die on brown cardstock to create my sentiment. I adhered to the circle and let it hang off the sides. After this was done, I wrapped a piece of burlap looking ribbon from The Paper Studio around the card. The most difficult part of this easy card to make was the heart embellishment. I used a heart shaped die from Paper Smooches on white cardstock, but I ended up embossing it with Liquid Platinum embossing powder from Ranger. I adhered it to the ribbon using foam adhesive. Pearls from The Paper Studio were later applied to the edges of the vellum. I really enjoyed making this card, and I love its relaxing color scheme. The next card I made with this paper was a simple thank you card. I took a similar kraft card base and I adhered the patterned paper to the entire front of the card. From there, I took my We R Memory Keepers Corner Chomper and rounded the corners. I love this tool because it helps cards to look well put together. I cut an 1.5" strip of kraft cardstock and adhered a 1.25" strip of the patterned paper on top of it. This strip was glued in the center of the card, and I made sure to make sure the chevron pattern was aligned across the entire card. 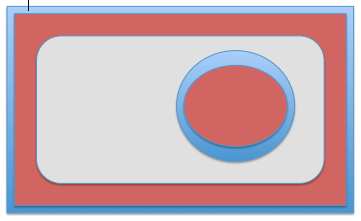 While the strip doesn't stand out too much, it adds texture to the card and breaks up the background without being too disruptive. Little tweaks like this to a card can make so much of a difference! After this was completed, I cut out a square of kraft cardstock and rounded the edges like I did with the card base. I used the Many Thanks stamp set from Paper Smooches with Versamark ink and embossed my sentiment with Liquid Platinum powder from Ranger. I added a few final embellishments to the card with pearls from The Paper Studio. I hope you enjoyed these cards as much as I enjoyed making them! Thank you for checking out my blog. Below I will link to some of the products I used in this project.